Medicinae Baccalaureus, Baccalaureus Chirurgiae, Class of 2019. Lifestyle Med Student Blogger. Disclaimer: the video has great content but the sound effects are really loud and very annoying…. The USMLE is an exam that has to be given in order to get a license to practice in the United States. It consists of three different tests but for the moment, I’m only concerned with the first test, called Step 1. It would basically cover all of the concepts covered in the first three years of medicine, from anatomy, physiology, biochemistry, to pathology and pharmacology. As you might have realized, it’s a lot of things! I spent the last weekend gathering as many resources as I could, from digging out old BRS PDFs to free question banks that I could use (detailed post on that later maybe). I had also bought my own copy of First Aid a long time ago and had got it chopped up into pieces a few months earlier and had them hole-punched so I could carry specific sections around in a folder or file instead of carrying the entire book everywhere. I’m deciding to take it a step further and start inserting my own notes in between the pages and once I’m done reconstructing First Aid the way I want it, I’ll get it binded in a book form again. 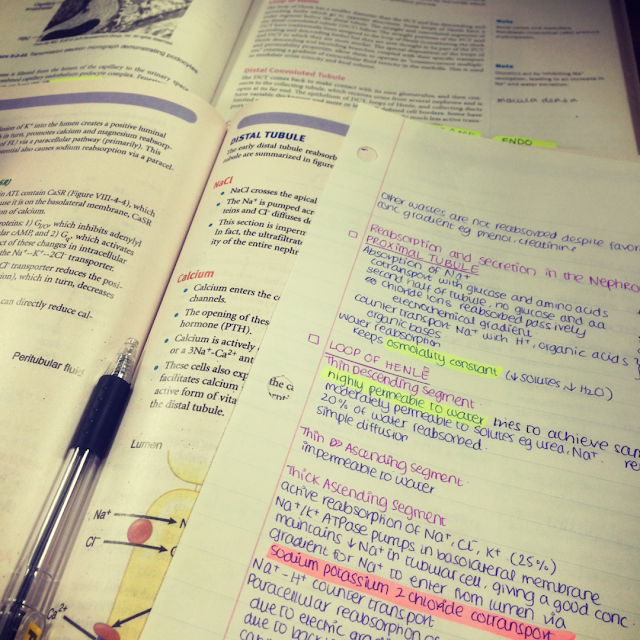 I’m also using Kaplan’s books, but only for anatomy, physiology and biochemistry since I plan on studying pathology from Pathoma and well… pharmacology is all rote memorizing and I’ve been making concise notes for microbiology in the form of tables. I don’t feel like I would need lecture notes for these subjects.I also recently bought the entire CD series set for the Kaplan lectures. So far, I’ve got the anatomy, physiology and biochemistry ones installed in my tablet. I don’t always watch the videos and I really need to start building a proper schedule where I cover as many of the videos as possible. Building a schedule isn’t easy, so I’ve been looking for good apps to help me. So far I’ve tried Habitica (it’s terrible. it needs an entire post of it’s own) and Timeful (but that was in first year), however these two apps are completely different. Habitica works on a list format while Timeful functions on a schedule format. I want an app that incorporates both things in. So I’ll be on the hunt for more apps. I think I’ll give myself until the end of April to find something that suits me. Till then, I’ll be posting reviews about the apps I’ve already covered sometime soon. Considering how I really want to change my schedules and fix my work load, the content of the blog might change accordingly so that I could use the blog to keep myself accountable for the work I am doing and simultaneously not be drained out when it comes to drafting and scheduling new posts! But don’t fear- I really don’t want to give up or put blogging on a back bench. I feel like even though my days are unscheduled, my weeks aren’t because of the two blog post days I have set up for myself and it really motivates me when you guys read my posts and comment! On that note, I would also like to apologize. I haven’t been very active in a lot of places and I have drawn back from a lot of conversations. Sometimes blogging does overwhelm me- not when it comes to posting, but when it comes to interacting with other bloggers. So I’m sorry if you’ve been trying to reach out to me or if it seems like I’ve stopped commenting on your blog. I just have to reshuffle my priorities and at this moment, my studies take a much higher rank. I hope you have a wonderful day. If you need to talk to me, feel free to direct message on twitter or instagram (although I personally don’t like either of those platforms for messaging). Emails are cool too, but those make me feel obliged to write a couple of paragraphs and I often don’t have time for that. But I’d love to talk to you guys! Stay safe. Like what you read? Enter your email address here to get updated as soon as I press publish!! i bought kaplan microbiology and pharma esay he excitement mein. have hardly used them :/ first aid pharma flashcards are awesome jbtw. and i use evernote, any.do & timespread as my to-do apps. timespread is meh, used it for MCAT mostly. looking forward to more updates!!! Yeah, I had a feeling I wouldn't be using those Kaplan books at all if I make notes from my course books with the USMLE specifically in mind. Cause I made the notes in first and second year to pass proff so there's a lot of unnecessary detail in there. Oh man, I definitely couldn't study anything medical and I admire people who do! It sounds like ridiculously hard work. I hope you can battle through it! I believe in you!! Thank you Charlotte! It wasn't terrible, per say, but it just wasn't the app for me! I'll be talking about it in my next post! This is bringing back all sorts of memories of my high school biology classes. 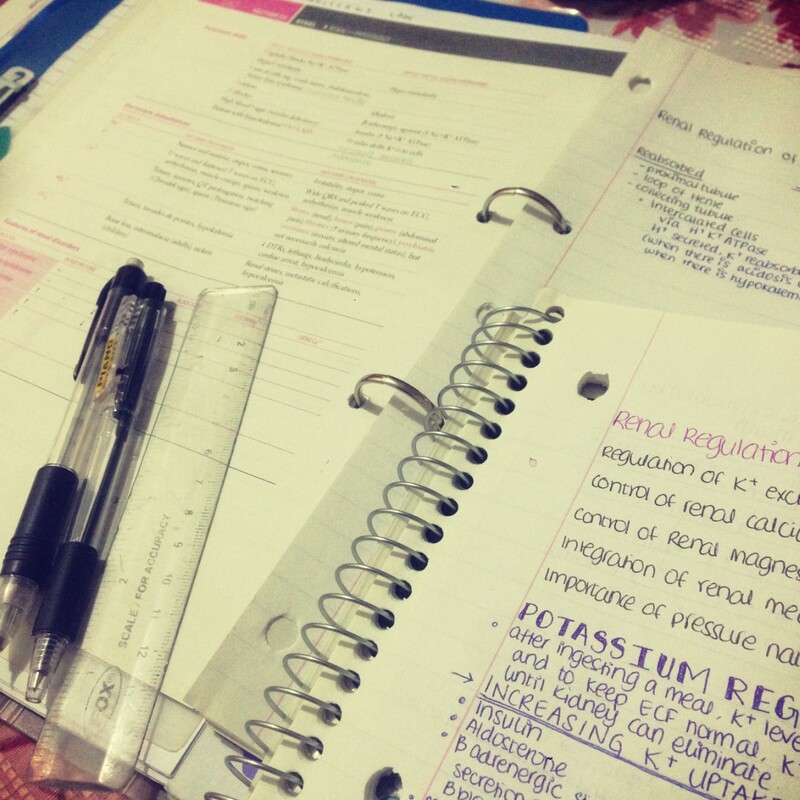 We did biology at the equivalent of first year university, so seeing all your notes really takes me back (although your notes are more detailed). Blogging can take a lot out of you. If you're busy, we get it. No worries! Wow this seems very intense! You don't need to apologise lovely, focus on what you need to focus on right now. Sending you the best of luck!